(Francisco Kjolseth | The Salt Lake Tribune) Pass game coordinator Aaron Roderick is interviewed by the media as BYU hosts their eighth-annual football media day at the BYU-Broadcasting Building on Friday, June 22, 2018. Like what you see? Subscribe to Eye on the Y, and any of our other Salt Lake Tribune newsletters here. After BYU’s second scrimmage of preseason football camp — a scrimmage that reporters were not allowed to watch — I asked quarterbacks coach and passing game coordinator Aaron Roderick if there was a particular team’s offense that BYU’s was patterned after. 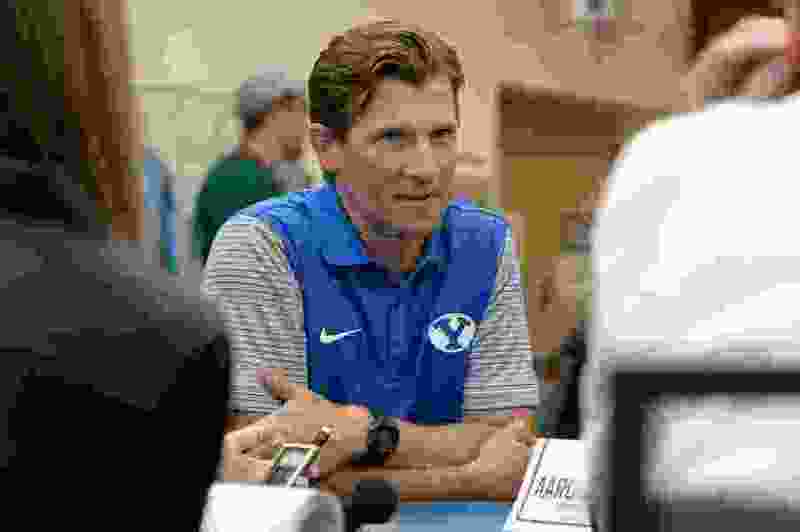 Roderick gave me one of those “I could tell you, but then I would have to kill you” responses, but it was obvious that, indeed, he and offensive coordinator Jeff Grimes had looked at some specific offenses when drawing up a plan for the Cougars. Turns out those teams are LSU (obviously, since Grimes was in the Bayou the past four seasons), 1970s and 1980s BYU and Boise State. Yes, that Boise State — one of the Cougars’ biggest rivals. 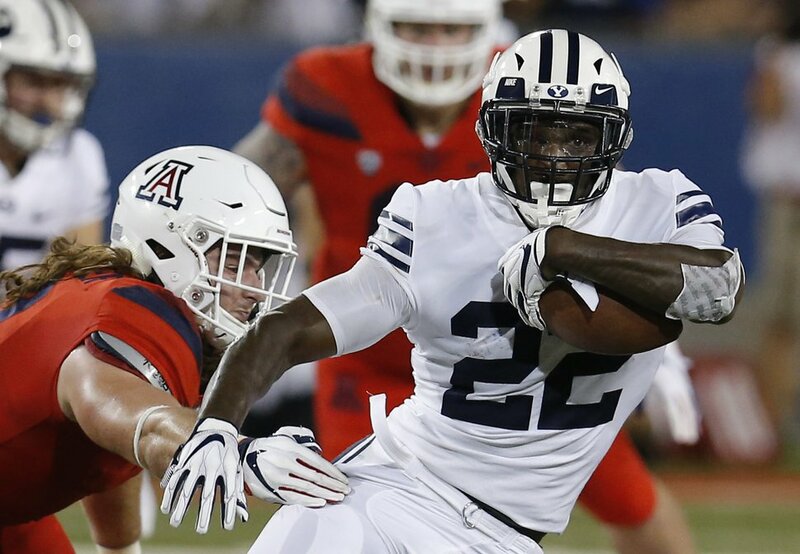 The jet sweep play that BYU ran nine times in the 28-23 win over Arizona and feigned a bunch more times has been a staple of the Broncos’ offense for years. And it was used a lot by LSU last year under offensive coordinator Matt Canada and his running game coordinator, Grimes. I asked Roderick about it Wednesday after practice as BYU continued preparations for Saturday’s 8:15 p.m MDT home opener against 1-0 California. The offense still doesn’t have an official name. But it is not easy to learn, Roderick said, and puts a lot of stress on the quarterback to make the right decisions, much like the run-pass option (RPO) plays that are popular around college football right now. Roderick said that the quarterback has to make the keep-or-hand-off decision most of the time, but there are times when he is supposed to hand it off no matter what. “There is a lot to it,” he said. For what it’s worth, Grimes told reporters Wednesday that the plays called against Arizona barely scratched the surface of the offense he installed with the help of Roderick, receivers coach Fesi Sitake, running backs coach AJ Steward and tight ends coach Steve Clark. A good half-hour after practice had ended Wednesday, a handful of Cougars were still out on the practice field, throwing and catching the football and working on specific pass routes. One of those players was freshman Zach Wilson, the rookie quarterback who lost the starting job to Mangum the last week of preseason camp. it was a sure sign that Wilson is still fully engaged in the competition, despite getting the “disappointing news” a few weeks ago, he said. I waited for Wilson to finish his extra work — tight end JJ Nwigwe and receiver Akile Davis also put in additional work — before asking him about just missing out on his chance to be the opening day starter. “It has been good. I’ve been fine,” he said. “I understand the circumstances and I am just approaching game week as if I am the starter, just to make sure I am always ready. I am just supporting the team and I know coaches are going to make the best decisions for the team. I just go along with everything and make sure I am prepared and make sure I am pushing Tanner every day. Roderick said Wilson has handled the setback like a pro. It is unfamiliar territory for Wilson, who can’t remember a football game in his entire life (when he was healthy) that he sat out the entire game. Even as a freshman at Jordan High (when Austin Kafentzis was the starting quarterback) he got to dress with the varsity and got in a few plays as a third-string receiver. He transferred to Corner Canyon for his sophomore year and beat out four other guys for the starting spot a few games into his 10th-grade season. Wilson said he was far more nervous about playing as a freshman at Jordan than he was as a freshman at BYU. • BYU’s women’s volleyball team continues to roll. The No. 9-ranked Cougars captured their own Nike-BYU Invitational last weekend, knocking off No. 1-ranked Stanford along the way in a five-set thriller. The Cougars also defeated West Virginia and Wichita State. On Tuesday, senior outside hitter Roni Jones-Perry was named the Sports Imports/AVCA National Player of the Week. She was named the West Coast Conference Player of the Week on Monday. • BYU’s women’s soccer team routed Idaho State 10-0 on Saturday night at South Field while the football team was dealing with Arizona, but the schedule gets more difficult for the Cougars this week. They will take on Utah on Friday night in Salt Lake City. Utah is 1-2-1 this season but surely will be fired up to face a BYU program that owns a commanding 21-7-2 lead in the all-time series. • It has been known for more than a month that former Gonzaga guard Jesse Wade was transferring to BYU, but on Tuesday the Cougars made it official. Coach Dave Rose announced that the 6-foot-1 Wade, who played locally at Davis High School, has joined the program. Wade played sparingly in his freshman season at Gonzaga after a church mission to France. At Davis, however, he was a prolific scorer. He averaged 26.8 points, 4.2 rebounds, 3.5 assists and 2.7 steals per game for the Darts his senior season.